IceBronz is bronze jewellery (blend of tin and copper) plated with a white metal that is hypoallergenic. The finish is like highly polished sterling silver but unlike silver it is protected from tarnishing by a thin film. All the hooks and studs on the earrings are sterling silver. The colourful inlays used in the jewellery are New Zealand paua shell (from sustainable sources) coated with a clear resin to make bright colours and glitter embedded in resin. The jewellery is very unusual, high quality and looks fantastic, you won’t find it in many places at the moment. I can get hold of variations in colour in all the styles so please e-mail me with any requests. On this page there are just a few of the styles and colours available in this lovely collection. 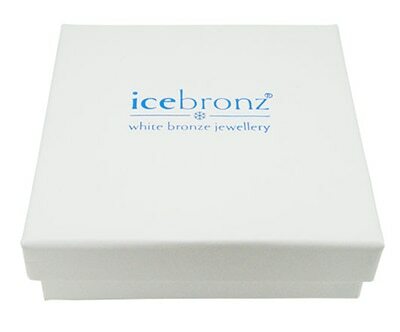 All jewellery comes in a beautiful customised IceBronz gift box. IceBronz jewellery is UK designed and hand finished.